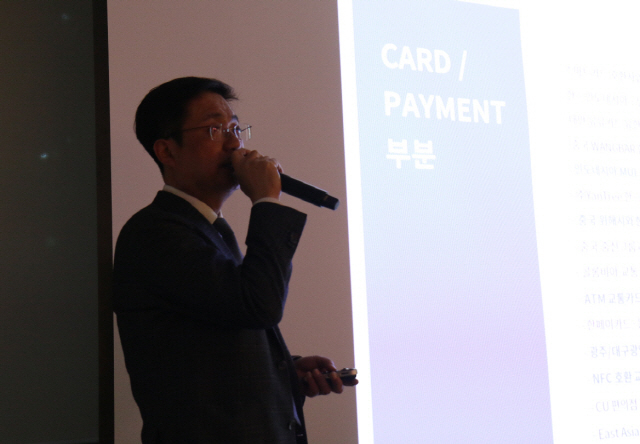 Korea’s credit card market amounts to 847 trillion won and Korea’s overseas remittance market reaches 30 trillion won. There are lots of problems in Korea’s payment and transfer markets -- 3 to 10 stages in credit payments, high fees and long adjustment hours. Cross of Coinone Transfer uses Ripple’s xCurrent to offer global remittance services. Blockchain fintech enterprises like Coinone Transfer provide faster and cheaper services than existing financial institutions do. “SWIFT frequently used in the overseas remittance business costs a lot because of many intermediaries and is slow. 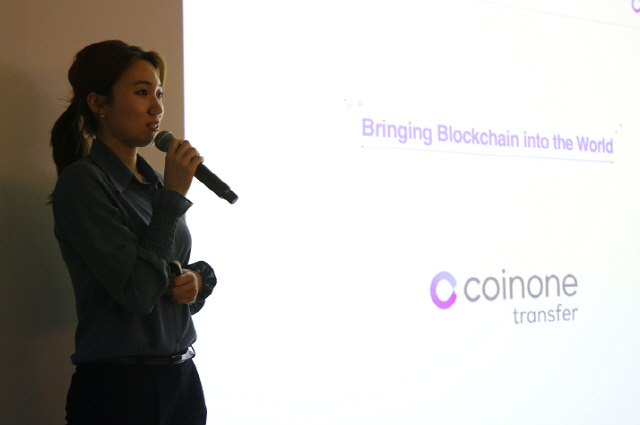 If blockchain devoid of intermediaries is used, customers could exploit services more conveniently,” said Chung Eun-jeong, team leader of Coinone Transfer. Coinduck simplified payment steps through Ethereum-based QR (quick response) code payments. “When the Bitcoin price soared, we felt that there must be the slightest line to connect real life with blockchain. Complicated processes like order, signature and verification with which banks, card companies, payment service providers and consumers have to struggle have been simplified thanks to blockchain,” Cho said. Coinduck creates Ethereum links at member stores and installs a QR code. If users pay after reading the QR code, Ethereum is sent before it is deposited in the Korean won the following day. Because fees are lower than those made by credit cards, Coinduck secured more than 1,200 member stores and 13,000 KYC customers online and offline. The service was embedded into the Galaxy S10, Samsung Electronics’ latest flagship mobile phone. Korean adults retain 3.6 cards per capita. The combined card market including transportation, credit and debit cards amounts to 847 trillion won. Blucon, the global payment platform using cryptocurrencies, aims to graft blockchain onto this card market. Blucon says it can play a role as a bridge between banks and cryptocurrency exchanges via its own blockchain platform EXO. So if card owners have crypto assets at exchanges, card payment is possible without changing money. “The IC chip in the credit card has only one function as use is dependent on what OS platform you are using. 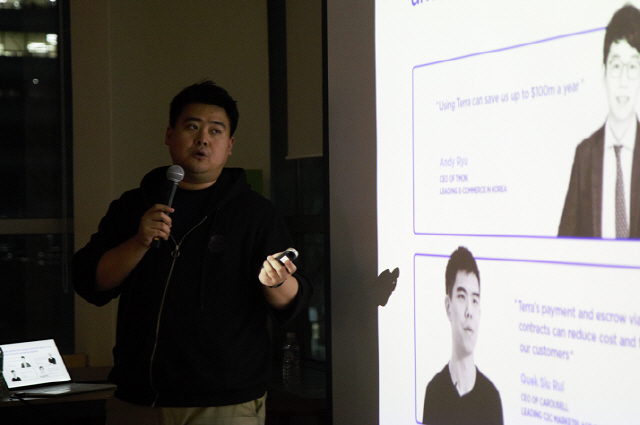 Blucon made it a multiple card OS to take the global initiative without massive investment,” Blucon CTO Albin Kwak said. What is important in cryptocurrency payments is not only the simplification of complicated processes. Ever-changing cryptocurrency prices are the biggest hindrance to boosting cryptocurrency payments. Terra, a blockchain-based payment system headed by the founder of TicketMonster, is trying to solve this problem by issuing stablecoins. With regard to why platforms have to adopt new blockchain-based payment solutions, Kim Kyong-don, head of business development at Terra, cited “lower transaction fees.” Using Terra could offer steady discounts of 5 to 10%. “E-commerce discounts can be raised through lower fees based on blockchain. Terra can cut price volatility of stablecoins by adjusting volumes through Luna while offering regular discounts continuously,” Kim said. As transactions are recorded in escrow, confidence in transactions can be enhanced. 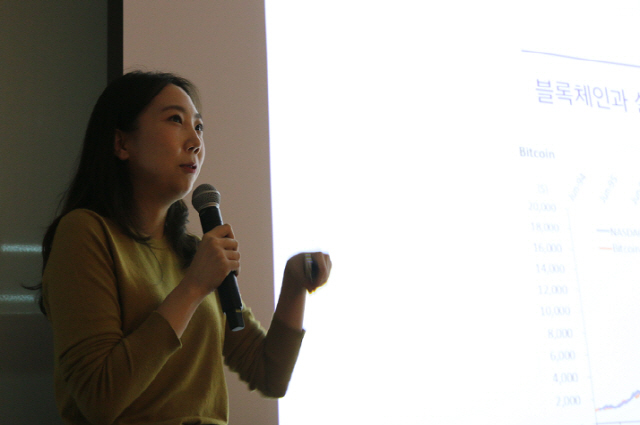 “We are convinced that our platform will upgrade the usability of e-commerce and service quality thanks to innovative fees, global payments and escrow,” Kim stated further.